This photo shows that the main focus is not on a round (or oval) ball, but on the refreshements connected to the event. I don’t think we are talking about enjoying quality brews in moderation here. Beer coverage in the New York Times again, this time it’s New Orleans breweries in focus. They call it the once — and possibly future — beer town of the South. I like the no nonsense approach of the article. This is not beer as an afterthought: Visitors come for a number of things that the city does like nowhere else: the music, the food, the architecture. I, however, was in town with just one thing in mind — beer. Norwegian maverick brewery Nøgne ø will be the first in Europe to start brewing sake. There have been rumours before, but now it’s official. They will use Italian rice for this. Brewer Kjetil Jikiun says to nrk.no that they will consider to start growing rice in Norway for their sake production. Sure. There are readers (and journalists) who will believe anything. If they make limited releases of sake, I’m sure the beer geek market will pay handsome prices for the bottles. Norwegian micro Ægir – named after the brewer of the Norse Gods, has an excellent writeup in the Dagbladet newspaper today. Available online, too, and the photos are even better in the web version. The coverage is enthusiastic, and the journalist seems to have gotten the facts right, too. Looks like he spent some time on the web researching. I really hope to make a visit to Flåm this year. While Evan’s beers are avaialble bottled, I’d like to try them on the spot – on tap. A new alliance of regional brewers has been formed with the long-term aim of funding a generic marketing campaign for cask beer, according to the Publican. They have picked the rather cumbersome name Why Handpull? Marketing Group, and include marketing staff from Wells & Young’s, Greene King, Fuller’s, Marston’s and Caledonian. One can always discuss the merits of the beers from some of these breweries compared to the smaller ones on the British market, but I find such an initiative a valuable contribution to a noble cause. 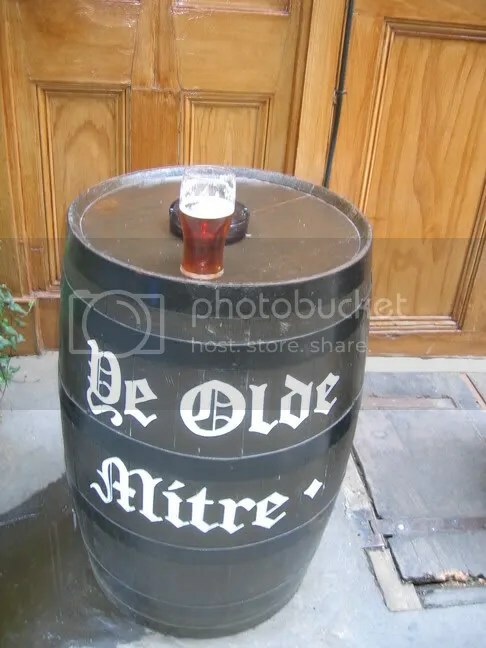 The photo is from Ye Olde Mitre, one of my favourite London pubs, which has just been aquired by Fuller’s. Let’s hope they let them continue their guest beer policy. Some of my drinking buddies are qualifying as beer judges in order to assist in homebrewing competitions. It is probably a good idea for me to do this as well, maybe I can expand my vocabulary a bit when I am writing about beer. There is a new book coming up that hopefully can help us along, too, Tasting Beer by Randy Mosher. I haven’t seen anything but the promotional material over at amazon, so I cannot vouch for the quality as yet. The book is out in the US already, the British edition is due in a month or so. I think I will be ordering a copy. Anyone had a closer look? Funky (e) Star – their Easter beer. Drikkeriget DIPA – A double IPA. Nelson Sauvin Single Hop IPA – beer number four in their single hop series. Oatgoop – a colloboration with Three Floyds, which they call an oatwine . What else? Cantillon Blåbær Lambik 2009. And a dozen premium American beers. Southern Tier, Lost Abbey, Alesmith…. One of each, please. When private import of beer is legalized later this year, we’ll have to convince Ølbutikken to do mail order!